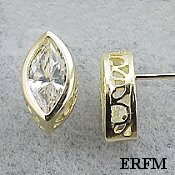 Marquis Cut Filigree/Bezel Russian Cubic Zirconia Earrings, Solid 14K Yellow Gold Studs... Bezel set mounting, Very Nice Stones!!! Top Quality Russian CZs. A little "Dressier" than standard studs!! !